That’s what a London Gatwick Airport security agent told me when my bag got tagged for a manual inspection. She was completely impressed because she couldn’t believe how efficient and well-organized my carry-on bag was! It’s been three days since my return home, and my body clock is still very off. They say it takes a day to adjust to each hour change, and it feels pretty close. I’ve managed to stay up a bit later each night and not wake up as early in the morning, but still, I was up by 5:00 a.m. today and am not able to snooze anymore. So now that I’m wide awake, I may as well be productive and finally share with you how I managed to travel with just 13 pounds for my Europe trip. Oh just a warning: Today’s post is going to be long. Grab a cup of coffee. First, the foundation: We were originally planning on traveling with another couple whom we’ve traveled with in the past, with an itinerary that included France, Germany, and Luxembourg. As a return favor for my providing a fair bit of translation and cultural knowledge about Japan on a trip we’d all made to Tokyo Disneyland a few years ago, our guide was going to be the husband of the other couple, who had spent a few years in France. However in an example of how our current bad economy affects us in direct ways, Alex and I were hit with unexpected news: The wife, who is a small business entrepreneur, was forced to decide between going on vacation with us, and keeping her business afloat. At that point, we could’ve decided to just scrap the trip altogether, except for one minor thing: I’d already bought Alex and myself nonrefundable tickets on Virgin Atlantic. Getting over our disappointment at not being able to travel with our friends, Alex and I looked at each other with “Oh my god, what the hell are we going to do now?” drawn on our faces. With zero independent itinerary, zero French/German language skills, zero travel knowledge of the area, we were at a complete loss. It wasn’t until a few days later that I’d had an idea: Check to see if Rick Steves had any tours that would fit our schedule. We were in luck. There was one tour that fit our schedule exactly: His Best of Rome in 7 Days city tour. [How many people chose to go to a destination because they looked over a list of tours and picked the one that fit their flight schedule?!?] The tour was spendy but since we were completely noobs we felt it was worth the price. Once our main destination was set, everything else fell into place, with plans to spend a bit of time in London (since we were flying in and out of Heathrow), as well as in Paris for a few days so we could see both the city as well as Disneyland Paris. If you’ve never seen Rick Steves’ PBS series on traveling through Europe, he is a firm believer in low-key immersion travel. Pack lightly, stay in smaller hotels run by locals, focus more on learning and absorbing the culture in smaller groups rather than being shuttled around like cattle and spending all your stops in tacky gift shops. Rick Steves also happens to be one of my personal heroes because he was the one who originally inspired me to learn to travel lightly. That, combined with the fact that Alex and I would be on all sorts of public transportation with our luggage, meant we were going to avoid check-in luggage at all costs. Traveling with just my carry-on? No problem! Not even a challenge! …except there was. It was called “Virgin Atlantic’s unusually small weight restriction for carry-ons.” If you read my previous entries, you know that we had to limit ourselves to no more than 13 pounds (6 kilograms). Most full carry-ons will probably run you at least 20-30 pounds depending on the weight of your bag, so getting our stuff together in the weeks before our trip became almost like a game for us. We were successful, but not without a lot of adaptation and sacrifice. 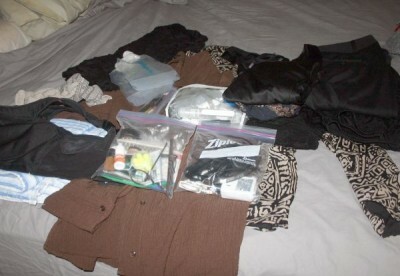 I based my initial packing list on the one Rick Steves recommends for women. I provide the original list here, with my notes on how I adjusted it for the trip. Some assumptions I made included October weather in Europe, which ranged from the low-40s to the low-70s. Each item is followed by a description, and any pertinent comments (negatives are in red, positives are in green). Those I did not pack, are crossed out. 1 pair of walking/comfortable shoes – This was the single, most important decision I was going to make. After reading the “Best Walking Shoes” section for personal recommendations at Rick Steves’ site, I chose a pair of Keen Seattle shoes. Since Keen no longer makes them, I had to do quite a bit of looking around online before finding one. I also took a spare pair of insoles with me, and swapped them out daily to keep my feet feeling less tired. At the end of the trip, I tossed the spare insoles away. These shoes worked out great for my feet, which are wide. 1 pair of sandals (weather permitting) – I couldn’t afford a second pair of real shoes, so I took a pair of Pocket Slippers from Magellan’s. They roll up and tuck into a little pouch that weighs just a few ounces. This was a waste of space for our particular trip since I only wore them on my flight to London. But they are keepers for future trips. 1 rainproof jacket – I picked up an LL Bean Storm Chaser 3-in-1 jacket, which has an inner fleece that zips out so you can wear it as a fleece jacket. And since the two zip up into one jacket, it was less I had to carry if I wasn’t wearing it. I applied Scotchguard on it to get a little more protection on it, although it should do OK in light showers. This jacket is terrific! Big pockets, zippable pockets, secret inner pockets, and comfortable. Highly recommended. 2-4 pairs of shorts/capris/skorts – I assumed it would be too cold to take shorts. 2 pairs of pants (one dressy, one casual), 1 belt – I wore one pair of slacks, and packed a second pair. The second pair was a Slinky brand from HSN.com, but it’s very similar to the Travelers line from Chico’s. That means no ironing, easy to wear. 1 swimsuit (packed in a plastic bag) – I assumed it would again be too cold. 5 1 pairs of socks (cotton blend) – The Keens can be worn with or without socks, so I chose to take just one pair of very thin Smartwool socks that I picked up from REI. Smartwool socks dry fast and don’t smell. I highly recommend them. 4-6 shirts (long/short-sleeved, various colors) – Assuming it would be cold, I took 3 long-sleeve nylon/polyester shirts, a button shirt, and a layering overshirt. I really wish I packed for warmer weather. My shirts were way too hot in Rome. Lesson: Check the weather right before your departure, and be prepared to adjust your wardrobe at the last minute. 1-2 light cardigans for layering – Instead of a cardigan, I used the fleece jacket from the LL Bean 3-in-1. So glad I just used the fleece lining instead. 1-2 skirts (wrinkle-resistant) – With colder weather I assumed this wouldn’t work well. 2 dresses (optional) – No special dinners, and no space in my bag. 1 hat – My jacket had a hood, but I also took a neoprene Headgasket visor from Croakies. I kept the visor in my daybag and used it all the time. It worked out great, especially in those sunny days in Rome! Scarves (to wear with clothing or hat) – I took a warmer scarf. This is one of the best things I took, since you can wear it instead of packing it when you fly. The wider ones work as a wrap on your flight, too. 2 vests (optional) – Completely unnecessary, and didn’t miss not having them. 1 pair of pajamas (or long shirt to get you to the bathroom down the hall if necessary) – No room, no need. Toothbrush/toothpaste/floss – I wound up not taking enough toothpaste with me but we made do with the baby containers of toothpaste we got from our Premium Economy amenity kits. Shampoo/conditioner – I took 1 ounce of shampoo and 0.5 ounce of Paul Mitchell leave-in conditioner. We augmented the shampoo with hotel shampoo, and it worked out perfectly. Brush/comb –I took a folding travel brush, which was small enough to carry in my day bag. Lotion –I took a tube of face lotion with SPF, which worked out fine. Vaseline (for feet) –Unnecessary; I just made sure I pedicured my feet nicely right before the trip. Razor (non-electric)/shaving cream or soap – I didn’t bother (since my leg hairs are almost nonexitent) but for most women it’s probably easier to get a professional wax before a trip. My husband just bought some razors when we got to Rome, and that worked out well. Alex used either soap or shampoo for his shave (after a shower so his skin was moist). Sunscreen, insect repellent –See lotion, above. Prescription drugs (in original container with your name and your doctor’s name, write down generic name) – I had a small prescription bottle with me that didn’t take up much room. First aid kit/moleskin/blister kit – I used a lot of Band-Aids preventively but I purchased them all when we got there. Feminine hygiene products –Assumed I could buy them during the trip if I needed. Deodorant – We actually didn’t take any. Shaving/trimming underarm hairs does wonders to keep the odor to a minimum. Given how warm it was in Rome, I wish we’d taken some. We used a lot of Febreze instead. Nail clippers/file/tweezers –I took a nail file and tweezers, and just made sure our nails were clipped before we left. Spare glasses and/or prescription, mini-eyeglass repair kit, or contact lenses and supplies –Neither of us wear glasses anymore, but we did take our sunglasses. Hand sanitizer – I didn’t take any, but I wish I had. I couldn’t find any in Rome, either. OTC remedies (whatever works for you): Pepto, decongestants, etc. –Took ibuprofen and acetaminophen; glad we did, since it took the edge off our sore feet at the end of the day. Clothesline, sink stopper, soap – These came in handy for washing our clothes in the bathroom. Baby powder (dry shampoo for hair) –Didn’t take any. Moneybelt: Passport, plane ticket, debit card, credit cards, traveler’s checks, railpass, driver’s license (if you’re renting a car) – Rick Steves tours make you sign an agreement saying, among other things, that you will use your moneybelt. This is not only for your peace of mind but also so the tour guide (and their travel office) doesn’t have to deal with the hassles of one of its customers having to deal with the U.S. embassy and banks during the trip. It was the one thing I made sure we followed, and our entire group in Rome did great during the tour, and nobody lost anything to pickpockets. We did have numerous attempts made on us, though! Guidebooks – I went to Kinko’s and had them cut the binding out of all our guide books. I then selected the pages and sections we needed, and rebound them into smaller books. This saved quite a bit of weight since we took guidebooks for Rome, Paris, and London. As we were done, we tossed the books. Moleskine notebooks – I’m one of those people who uses Moleskine books, so I took a Rome Citybook as well as a sketchbook. Drawing and writing utensils – Pencil, pens, small ruler, eraser, and so on… didn’t take up too much space but I wanted the opportunity to do some sketches. Various electronics, including an iPod Touch, a Sennheiser noise-cancelling headset, AC adapter. I tried to take items that were as small as possible, and I managed to fit them all into one liter-size Ziploc bag. Addresses – I ran out of time, and wasn’t able to put together an address booklet of people I wanted to send postcards to. What would have been easiest was to hand write the addresses on a strip of adhesive mailing labels. A pair of capri pants –Given how warm it was, I probably should have traded my Slinky slacks for a pair of capris. Short-sleeve shirts – I really wish I’d swapped some of my long-sleeve shirts for short-sleeved ones. I was completely prepared for layered clothing for cold weather, not hot. More podcasts, books on tape (MP3 format), and albums for the iPod – I wound up mostly playing Bejeweled and Jewel Quest. A tiny digital camera – I didn’t take one because Alex was taking his SLR; as it turned out, he mostly took “photographs” whereas I would’ve taken more snapshots of things like our tour group (who were a terrific bunch, by the way). Items packed for the Europe trip include Ziploc baggies for electronics, for miscellaneous junk (medicine, pens, earplugs, etc. ), toiletries, clothes, a very thing Japanese bath towel, and a couple of Platypus brand collapsible water bottles. One thing we collect when we travel, are refrigerator magnets of the places we visit. We adhere to a strict guideline (for example, we have to both go together, and we they don’t count if they are souvenirs given to us from friends). Normally, these barely take up any room, but after a while they add a bit of weight. I was prepared to carry them in my jacket pocket for our flight home if necessary. 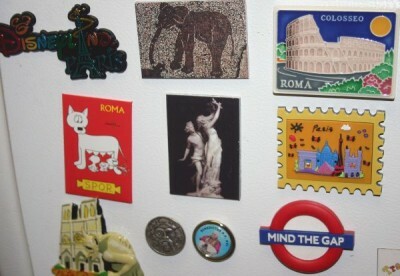 Refrigerator magnets from some of the places we visited on our trip. Can you guess where all of these magnets may have come from? One thing I was looking forward to was purchasing Moleskine Volant softcover notebooks—they are currently available only in Europe. I found these in a bookstore in London. Don’t let your eyes deceive you; the larger notebooks in the photo are the small index card sized versions. The smaller ones are slightly larger than credit cards. Each Volant packet includes a pair of notebooks of the same color scheme (one lighter, one darker). If you look carefully, the small green one is by itself; I unwrapped it and started using the lighter green one during the trip! 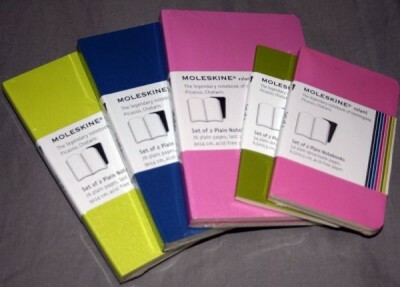 Moleskine Volants, purchased in London. These weigh a bit so I was also prepared to just stash them in my coat pocket for my flight home. Finally, I kept various paper receipts, tickets, and such so I could eventually put together a trip report and remember where I went. These take up almost no space or weight. Used tickets and other small, flat souvenirs. 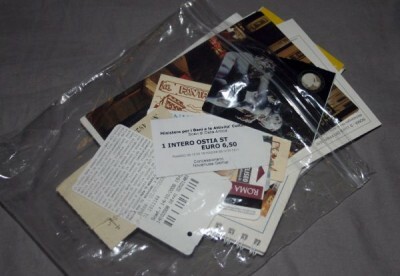 Ziploc baggies – More than anything, I used a lot of Ziploc baggies. I normally use fabric ditty bags and cosmetic bags and such, but the only non-disposable one I used was my Paula Begoun makeup bag, to hold my toiletries. While the dimensions are approved for air travel, her bag is gussetted, which lets me carry way more stuff than in a Ziploc liter-sized bag. I used Ziplocs to separate clean underwear from used, to hold my electronics, to hold our fridge magnets, and so on. Where I would have used a net fine-washables laundry bag, I used a Ziploc bag. In addition, I went to a local craft store and picked up some smaller resealable baggies (2″x3″ and 4″x6″) for things like holding Band-Aids and Q-tips. Speaking of Q-tips, I normally take the little travel container but I did away with the container to save on weight. Instead, I counted how many Q-tips we were likely to use (1 per person per day, with a few extra thrown in), saving a fraction of an ounce. Weighing every item, and taking only what I planned to use – I had to make some tough decisions about my wardrobe. In hindsight, I wish I’d gone with two short-sleeve shirts and a long-sleeve instead of three of the latter, but I really didn’t expect weather in the high-70s all week in Rome. That said, I still chose the most lightweight of my shirts; they were even lighter than cotton T-shirts. Every liquid toiletry item was carefully scrutinized. Did I need a full ounce, or could I manage with half an ounce? Using the smallest version of everything – Instead of large and clunky AC adapters, we took a USB-to-AC adapter that was as small as a film canister. A laptop was out of the question, but the iPod Touch gave us the option to send email in wi-fi hotspots (including a free one in a small part behind the Notre Dame in Paris!). Tom Bihn Convertible Cube/Shoulder Bag – This bag turned into my everyday daypack, and it was awesome beyond words (see one of my earlier posts for a full review). I carried this thing everyday full of stuff, and it never saw any wear or unraveling at all. I routinely packed two soda bottles, notebooks, and various other sundries, and the unstructured form meant I could just toss things in willy nilly and have everything settle in easily. I cannot speak highly enough of this bag as a travel daypack. The Tom Bihn Convertible Cube/Shoulder Bag. I used this bag as a packing cube when I flew, stashing a lot of the assorted things in my carry-on bag that would otherwise get loose or scattered around in my bag. It’s where I put my underwear, socks, and other stuff that I put in my Ziploc bags. And once I passed security, I’d move stuff around in my carry-on, moving my toiletry bag and electronics baggie into the packing cube. When I get to my airplane seat, I just remove the packing cube to keep by my feet for easy access, and stow my carry-on in the overhead bin. Easy as pie and a wonderful solution without trying to shove the carry-on by my feet. One huge benefit to having a travel partner is your ability to share some things during the trip. For me and Alex, that meant sharing toiletries. He actually managed to fly without a toiletry bag at all! Alex is a very low-maintenance traveler anyway, and he just shared things like shampoo with me (or used the hotel supply). ExOfficio Trip’r line of travel shirts – He picked up a few from REI, but you can buy them directly from Exofficio online as well. The fabric is the typical travel shirt feel, but they make them in checkers and plaids, so you can completely avoid the “Hi, I’m wearing this khaki travel shirt” look altogether. The shirts are adequately vented, the chest pockets have zippers, and best of all, their buttons aren’t sewn on but instead, they are secured on with a little piece of fabric. It’s hard to describe; let’s just say you won’t worry about losing any buttons. Very attractive ExOfficio Trip’r shirts are available in patterns that don’t make them look like ordinary travel shirts. He also picked up a few pairs of travel-friendly underwear, which dried really easily on the clotheline. One item that weighs down a carry-on bag for the guys is their big shoes. So for this trip, he took just the pair he wore on his feet (a pair of nubuck New Balance shoes). He made sure to break it in for a few weeks before the trip. Alex’s biggest challenge was his camera gear. He has a pretty nice Canon digital SLR that he wanted to use for his trip, but wanted to avoid using camera bags that were too easy to identify (and which also tended to weigh too much). Up until right before the trip, he was planning on taking a Tom Bihn Large Cafe Bag, although we were a bit concerned since the fabric is thin for a camera. At the last minute, he chose to take my Timbuk2 mini Metro Messenger bag, and that turned out to be a great decision. The biggest reason he changed his mind was that Cafe Bag doesn’t have the ability for you to remove its shoulder strap; this turned out to be a huge disadvantage. In order to save even more weight, Alex used the luggage strap for his carry-on once we were in Rome, to carry his Timbuk2 bag with—he couldn’t do that with his Cafe Bag. The Timbuk2 is also pretty water resistant, which worked out well on one day in Paris when we met with some foul weather. For packing purposes, Alex put all his smaller items (underwear, socks, etc. around his camera gear) in the carry-on itself so that the Timbuk2 bag was safely packed in the carry-on. Timbuk2 Metro Messenger bag. 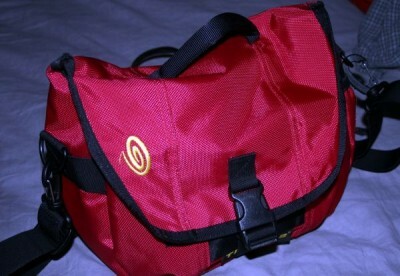 Although this bag isn’t padded, it’s very sturdy, making it an option for carrying camera gear. If you bang up your camera in this bag, though, don’t blame me; do so at your own risk! We had both planned to use the Outdoor Products Carryon Bag, however we discovered that the bag was actually too big for the items we put together to pack! Instead, I wound up using the discontinued Sierra travelpack from Uphill Down, and Alex used a discontinued travelpack model from MEI in Canada. We could have used the Outdoor Products bag but we both felt that we might be tempted to pack more stuff in it during our trip, so we abstained. I’m sure we’ll use the Outdoor Products bag in future travels where bag size—and not weight—is the limiting factor. All in all, the 13-pound weight limit imposed by Virgin Atlantic was an awesome challenge, and we wound up thoroughly enjoying the opportunity to test our packing abilities. For years, I’d become pretty complacent and not being particularly fastidious in my carry-ons since it had gotten to be old hat, so being forced to face a new test kept me on my toes and more excited about the trip than originally expected. I don’t know that I’d pack that lightly again unless I’m forced to do so. I wouldn’t have minded taking a third pair of pants (or capris or skirt/skort), and maybe a T-shirt. That said, let me tell you—a 13-pound bag is a breeze to carry! I think in the future I may try to keep it down to around 15 pounds or so, just to make it easy for me to carry through the airport. Great report. Did you use the Outdoor Products Essential Carry-On? If so, how was it? Did it hold up well? Oops, never mind. I realize I originally missed the paragraph where you talk about the Essential Carry-On. Thanks for the detailed report! I think when we travel minimally, we have to be really thoughtful in our packing and continuously revise our lists depending on the season, locale, what we can expect to acquire while traveling, etc. Thanks for the great list. We didn’t know about the 13 lb limit the last time we flew Virgin and had to do some quick shuffling. I saw those new Moleskine books at the Boston Museum of Fine Arts this fall. I didn’t buy any, but now I wish I had. Do you have any recommendations for brands of lightweight shirts and tee shirts? I got a lot of good information form your report. Thanks. Welcome home. You and Rick Steves have long been my travel gurus, but at the moment I am a pretty non-tech traveler. For our month in Italy next March, I am considering an Ipod Touch (never used an Ipod or MP3). Can you recommend a charger for that and rechargable AA batteries (digital cameras)? Thank you. Annie S, I’ve been using Eneloop batteries by Sanyo for over a year now. They come in AA and AAA, and there are C and D size adapters for other uses. They hold their charge for at least a year, unlike the older rechargeable batteries, and they’re available at Costco or Amazon for really good prices. I recommend getting the 2-battery travel charger set from Amazon if you plan on using them just for your camera, as it can charge 2 AAAs in 2 H 15 M, and 2 AA batteries in 4 hours. The larger 4-battery charger in the Costco set takes 10 hours or more, and it’s all too easy to leave the charger behind in a hotel! If you plug the small charger in before dinner it will be done by bedtime. Both chargers are good worldwide, just bring plug adapters. If you go the Amazon route, get the batteries/charger FROM AMAZON. Do not use one of the other Marketplace sellers. If you add just one paperback book you’ll qualify for free shipping; the Marketplace sellers have pretty steep shipping charges. I’m using a Samsung digital camera, and although I carry a spare pair of Eneloops in my daybag, if I start the day with fully-charged Eneloops I’ve never needed to swap them. If only one of you is using them, a pair and a spare pair should do. If you decide to use them for other things at home, get one of the big sets as well. Sorry, can’t help you w’ the iPod info; I’m still using my Pocket PC! Alana, Thanks for the help, I’ll check it out. One idea for you: I recently started traveling with a light jacket from Scottevest. It has about 20 pockets, some large enough for even magazines. It also has removable sleeves. I’ve found that I can take a lot of stuff out of my carry-on to save weight. I typically put my phone/PDA, Bose headphones, a paperback book, pen, small notepad, ipod, 3-1-1 baggie, and travel documents into the jacket/vest. Even with all that, I still have plenty of room if I need to lighten my carry-on. One added benefit: I can just take the jacket off and send it through security at the airport. Makes things go faster. Lani, can you tell us a little more about the storm chaser jacket? How much does it weigh, and how “bulky” is it? Did it take up much room in your bag? I’m very interested in the mens version, but I want a jacket which can be carried in my bag, and space is ALWAYS at a premium! I’ve been deluged with work and haven’t had time to post a reasonable reply for you; I apologize. The main thing you need to know about *any* “three-in-one” type jackets is that they’re usually designed to be pretty bulky when they are all zipped up together. That means the Stormchaser is actually pretty bulky… *IF* you have the inner fleece lining jacket zipped in. The fabric otherwise feels pretty good and it isn’t too thick. You could probably roll it into a bundle and stuff it in your bag without too much stress. The fabric is also not rubbery-feeling, which is nice because I’m not too keen on those. That said, it’s NOT at all like the Sierra Designs Micro Light Jacket (http://www.rei.com/product/772609) which I believe is probably the best roll-up jacket to stash in a bag. If space is at a premium and you don’t need a thick jacket, you might want to try Scotchguarding that one and hope for just wind (and no rain). Fortunately since the Stormchaser is from LL Bean, if you’re willing to be a little patient, my suggestion is you go ahead and buy one and check it out. Their return policy is very nice and you won’t have any issues. They will prefer you use UPS but I’ve mailed stuff back using Priority Mail for a couple of bucks without any problems. Eric — I’ve received more than a couple of recommendations for the Scott eVest. I’ve looked at the demonstration video they have at their Web site, and it definitely looks interesting! I think my main concern would be forgetting which pocket I used to stash my stuff! Thanks for the recommendation. Wow, I just stumbled upon your site accidentally and felt compelled to comment (never happened to me before!). I love travelling, especially finding ways to travel light. Your site is amazing and so helpful! Keep up the great work!! Thanks for posting! I’m going on a trip this spring for 3.5 weeks, and found out that I also must keep my carry-on under 13lbs. I was really worried about it at first, but your post helped alleviate my fears a bit. I have a quick question, though: what were the size of your bags? I attempted looking them up, but as they are discontinued, I couldn’t really find anything about them. Please let me know, as I’m attempting to figure out what to use as a carry-on and could use much help! Hi Margo — if you have a weight restriction, your biggest advantage in bag choice will be in going without the wheels. I know that provides a lot of convenience, but that usually adds 3-5 pounds or more to a bag; pounds you can’t afford to give up. As long as the bag is small enough to be considered a carry-on (typically, 21 x 14 x 7 or so) it’s OK, but another tip is to consider using a lighter bag. If you would like to have backpack straps, one of the lightest you will find is the Jansport Weekender bag. The straps zip away if you want to just carry it as a shoulder bag. Another one known for being lightweight is the LeSportSac line of nylon bags. They don’t have a bag with hideaway backpack straps, but they have weekender bags as well in a shoulder bag style. Just be very careful weighing your bag because if you pack them full you will probably exceed your weight limit. The other trick that worked well for us was to stuff some things in our jacket pockets that we knew would weigh our carry-ons down, like my husband’s telephoto camera lens. Thanks, I had a hard time figuring out how get it right. I did this and it works for me. Thank you again! One thing I always take is a very light shopping bag that folds up into itself when not in use. It takes up almost no space and it weighs nothing, but it’s incredibly useful – carry in your pocket or day bag for shopping and also use it for carrying toiletries to the bathroom or packing your damp washing in if it just didn’t dry overnight. Also if you do wash your “smalls” every night, you can get away with two pairs of socks, two bras and two pairs of undies. Rick’s list has too many clothes on it for my liking and I pare it down even for journeys of six or eight weeks. Gadgets can be reduced as well. I carry just an iPhone and charger and tiny earphones. It’s got a decent camera for my point-and-click snapshots. It will hold your address book, maps, travel guides and even books. With it you can connect to the internet for your email, web sites etc. Load it with your music, photos of your children, games. It’s been a big help in cutting down the weight and bulk. Did you have a detail list of items that your husband packed? Hi William! Since it’s been a few years, I don’t remember off the top of my head. I’m pretty sure he took a pair of jeans and an extra pair of slacks… I’m also pretty sure he just took the one pair of walking shoes with him without taking another pair (that saves both a lot of space and weight). He wears suede Rockports that look fine, and he can walk around in them all day. Your packing list is taken directly from Rick Steve’s. Nice try! It’s his exact list! Jackie, did you see the introduction to the list, where I said, “I based my initial packing list on the one Rick Steves recommends for women. I provide the original list here, with my notes on how I adjusted it for the trip.”? I think you misunderstood my list. I apologize for not realizing that’s what you meant in your initial comment. Yes, the original list is from Rick Steves for *this* particular trip. And then I added my notes about how each item worked (or did not work) for my trip, and crossed some items out from his packing list that I thought did not work (and which I didn’t take). Hope that helps! PS: In case it wasn’t clear in my introduction, the primary destination of our trip was the 7-day Rome City Tour put on *BY* Rick Steves’ operation… so the packing list is what HE recommends to the people who signed up for the tour! So I wasn’t just “lifting” his packing list; I was using it as the basis for my packing list for HIS tour, and amending it to fit my needs.